Domain age is one of the factors in SEO rankings of your website. Domain with longer age gives preference to Google the newly registered domain because it gives the confidence to search engine and visitor a trust by giving a value for a long time to the visitors. In Many SEO forums, SEO marketers ask a basic question that domain age is an important SEO factor or not. But google algorithm identifies the site quality signals including external links, links over a period of time. Because many SEO marketers try to fool search engines by purchasing an auctioned domain which as good domain age compared to fresh domains. The domain which is purchased had been spam backlinks or just parked domains. Sometimes domain age does not be a ranking factor, but the domain age should be earned through quality SEO marketing. The domain age checker tool helps the user to check the domain age of any registered domain visible on search engine. It is absolutely free to use the tool and check your domain or competitor's domain. A domain name is the URL of your website, the same address through which internet users access your website. The domain age is the vintage of a website on the internet. The domain age gives you a brief idea of how long the content has existed on the web, how long the domain has been promoted, and the date of the last update of the content. Google, the most trusted search engine, minimizes search engine spam by allotting waiting periods to new websites before giving the domain PageRank. This waiting period can range from three to four months. Search engines consider domain age as a critical factor to rank websites or domain names. The domain age tells a lot about a website, its establishment, expiry date, the history, any negative reputation attached to it, page authority and more. These are discussed further on. To ascertain the age of a domain. To ascertain the age of a competitor’s domain useful to formulate strategies. This gives you an idea of whom you’re competing with. To know the exact date, day, month, and year of the domain name created. To view the date you last updated your domain. To view the domain expiration date. To view your IP address. To know who is hosting a website currently. To know the type of IP address. To know the name servers that are attached to your domain name. To know the backlinks as to check the domain name history in Archive.org. The owner of a domain name puts in efforts to build quality backlinks. Thus, search engines consider the quantity and quality of backlinks while ranking websites. To view the past contents, designs, layouts, and more. Registrar of your domain name. Why we need a domain age checker tool? Or Just any age which is longer than other domain names. You want to buy and sell domains for higher profits at domain auction sites. So you bought a domain a long ago from any hosting related sites and just need to check your domain age. If a webmaster has purchased multiple sites a long ago and forgot which domains are of higher age and which domains are not. So the best way to know the age of your domain is by looking into our domain age checker tool. In future you may be looking to develop a new website related to other niches, so you are looking to purchase more domain aged sites which have a good reputation score, traffic, and links which help you improve rankings in short period of time. It gives you an idea which one suits better rather than purchasing a new domain. Many experts suggest buying a domain aged sites because it will have very good backlink profiles and greater credibility in the google search engine. Not only that if you have purchased a new domain from any domain hosting sites, but it also takes a lot of time to build quality links and google algorithm gives boost traffic to well authority sites rather than new domains. Many links which linked to the old domains will have natural links which will have a positive impact on organic search results and it is a big plus who owns an aged domain. So do thorough research on niche related domains, long existing domain name, with good quality backlinks will do perfectly well in search results. In fact, most SEO experts feel that the domain age is also one of the key seo factors which play an important role in ranking. Within a few days of publishing the sites will have a certain amount of traffic due to its previous seo efforts. If you work smart now you can easily improve organic search results over time with fewer efforts in the future. Once it starts to rank it will save your time, efforts and money for the next succeeding years. After buying a successful domain it is important to build site reputation score from scratch. So start posting regularly the content related to your niche and build more visitors to your site against competitors site. This gives you self-confidence about the site and trust for the visitors in the long run. You may be thinking that long-existing domain names are very trusted and improve ranking within a few months. So that is not the case of some old domains. Old domains may have some bad links coming from other sites, which leads to spam and google may be removed from search engine results. Suppose you think that the previous site owner may have been used some black hat seo techniques to gain links and traffic. Before purchasing always keep this in mind. Suppose, you liked the domain very much but it has too much spam score and bad links. Before making a decision or going live consult an SEO expert to remove all the unnatural links for the domain will help you in the long run. 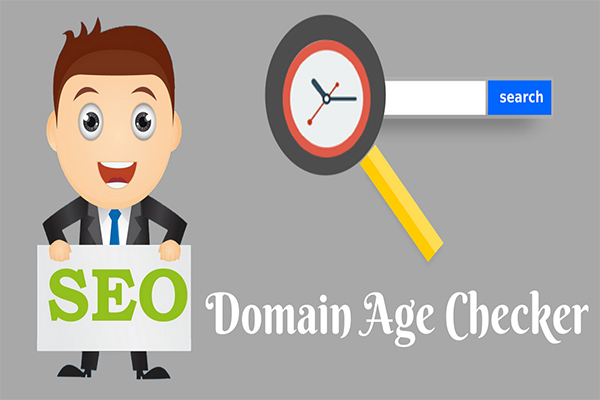 ​​How does domain age checker tool work? For more information on domain age, check Matt Cutts site. Search engines consider domain age as one of the critical criteria to rank a website. Older websites are considered to be more credible and stable than new ones. Older ones have more reachability and visibility than the newer ones. They also have more credible and are stable than the new ones. Domain age is a critical driver of your website’s traffic. Any new website owner finds it difficult to drive traffic irrespective of the quality of the content. With this tool, you can check the size of the domain’s backlink profile. Domain owners of a domain name put in considerable efforts to build quality backlinks. Thus, search engines consider the quantity and quality of backlinks while ranking websites. With this tool, you can check the domain age of a website you wish to buy. Older websites get automatic page authority and domain authority over time. Thus, the business of buying and selling of old domains has gained much popularity. Google used to rank domain and pages based on their PageRank mechanism. Webmasters use this as a basis to buy and sell domains high Page Ranked domains and also to purchase links from them. Now, you have domain authority checker tools from various search optimization firms such as MOZ. A website with high domain authority value sells at a higher selling price and demand in the market. So, use a domain name age checker tool find out the vintage, history, and backlinks of a competitor’s domain name so as to level up your SEO performance and shoot your content to the topmost ranking lists of a search engine results. You can also use this tool to ascertain if a website that you wish to buy is worth the investments. It will help you in making the right purchase decision in the sense that you can find the ones with strong backlinks, authority, and reputation. Also, you can find out a domain’s reputation to clear any negative or dirt and take necessary measures to tackle the impact and negate it so as to build a new and good reputation. According to SEO marketers, domain age signals holds around 0.5% in search engine ranking results. Domain age ranking factor depends on trustworthiness and quality signals achieved by the site.